Taunggyi has a special festival every November during the Full-moon Day of Tazaungmon. This is the Buddhist festival of Tazaung-daing which is celebrated all over Myanmar and is a public holiday. In fact Tazaung-daing is also celebrated in Thailand as Loi Krathorn. It is a festival of Lights like Thadingyut, one month earlier in October which marks the end of the Buddhist Lent and also coincides with the retreat of the southwest monsoon from Myanmar. Thadingyut is sometimes marred by some rain and storms as it is a transitional period of seasonal change, but Tazaung-daing in November is a time of clear, bright blue, azure skies with hardly any clouds and so this second Festival of Lights is usually celebrated on a grander scale. In fact it is said to be a pre-Buddhist festival. 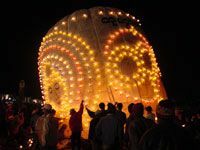 Taunggyi is justly famous for its Tazaung-daing Festival, when huge fire balloons are released at day and night in various fanciful shapes and made to go up into the clear, cool, night sky. In old days, the fire-balloons are flied up to sky, dedicating to Sulamuni Pagoda that is said to be situated at the Tawadaintha, the Heaven. 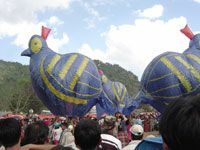 These huge balloons are made of local Shan paper or rags, and are of different sizes and shapes, some human, some animal, some just fanciful products of imagination. The hot-air balloons are designed with colorful fireworks and firecrackers. In fact, they compete over their beauty and the altitude they can gain. Robe-offering ceremonies are also held at the same time. This is the most magnificent festival in Taunggyi Region. After breakfast at the hotel, transfer to airport to Heho by domestic flight. Drive to Pindaya to visit Pindaya caves, unique for the thousands of Buddha Images placed by there pilgrims over many centuries, drive back to Nyaung Shwe. Transfer to Nyaung Shwe jetty and boat trip to Inle lake . Overnight at the hotel in Inle. After breakfast, sightseeing in Inle Lake by boat. Visit to famous Phaungdawoo Pagoda, the most revered one on the lake, Ngaphekyaung Monastery - well know for its jumping cats and numerous collections of Buddha images and alters the weaving village of Inpawkhon. Transfer to Nyaung Shwe Jetty by boat. Continue a drive to Taunggyi. On arrival Taunggyi, late evening enjoy at Hot-Air Balloon Festiva. Dinner & overnight at the hotel in Taunggyi. After breakfast, drive to Kakku. On the way visit to Taunggyi Market, Continue to Kakku - very impressive with it's beautiful 2548 pagodas believed to have been built since 307 BC and two old bronze ringing bells. Lunch and drive back to Taunggyi. Late evening enjoy at Hot-Air Balloon Festival. Dinner and overnight in Taunggyi. After breakfast, drive to Heho Airport and fly back to Yangon. Arrive at Yangon Airport, on the way visit Loka Chantha Abhayalabhamuni Buddha Image that made from a single piece of White Marble Stone and the White Elephant, Naga Glass Fatory , can study and buy hand-blown glass ware, Kabaaye (World Peace) Pagoda, walk into the Great Cave (man-made cave), which was built to hold sixth synod of Buddhist monks in order to revise the Buddhist scriptures. Evening visit to China Town. Dinner and overnight at hotel in Yangon . After breakfast, visit to Shwedagon Pagoda the landmark of Yangon and one of the world's most spectacular religious monuments. It is said to be built over 2000 years ago enshrining the hair relics of Buddha. Continue to Chauk Htat Gyi, to see the huge reclining Buddha Image and then to gilded Sule Pagoda, over 2000 years old, and still stands as the landmark of Yangon City Center. 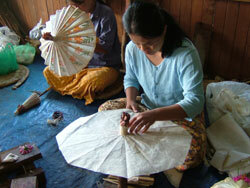 Proceed to Bogyoke (Scott) Market where hundreds of stalls of souvenirs and handicraft shops can be visited. In the evening, transfer to Yangon International Airport for Departure.